I'm an avid watch collector and trader, and founder of Watch Conspiracy. For the last decade, I've owned over 1,000 (not a typo) luxury timepieces from brands like Rolex, Audemars Piguet, Ulysse Nardin, Panerai, and more. Through my personal experience, and figuring out how to buy the right watches at the right prices, I teach regular people how to buy their favorite luxury timepiece for up to 80% OFF MSRP. I also expose my students to the $200 billion luxury watch industry that they can exploit for big profits as a watch trader, many of which now make anywhere from $5,000 to $15,000 trading watches part-time. I created Watch Conspiracy as a resource and platform to bring watch traders together and now teach you how to do the same. Have you ever felt overwhelmed, not sure what watch to buy, or even scared to go into a watch boutique? Trust me I've been there too. I've witnessed far too many people get scammed by shady watch dealers and jewelers with bad business practices, or burned on watch deals by being suckered into buying a counterfeits or ordinary models hyped as being 'special'. It was a few years ago that I realized that there wasn't a comprehensive resource available to anyone that was in the market for a luxury watch. In 2016, I launched Watch Conspiracy as the ultimate resource needed for anyone who wanted to buy their first luxury timepiece, but unsure where to start. Through my personal experience of owning every imaginable luxury watch possible, and dealing with hundreds of watch dealers, I've created a methodology that allows anyone to own luxury watches without losing any money, and in many cases, turn big profits just by wearing their favorite watch. I now teach these same strategies to over 2,500 students inside my Watch Conspiracy platform to do the same. This $200 billion industry doesn't have to be confusing anymore and Watch Conspiracy is here to help. Here is everything included with your Watch Conspiracy membership. This is an exclusive offer not offered anywhere else. This isn't just a course. 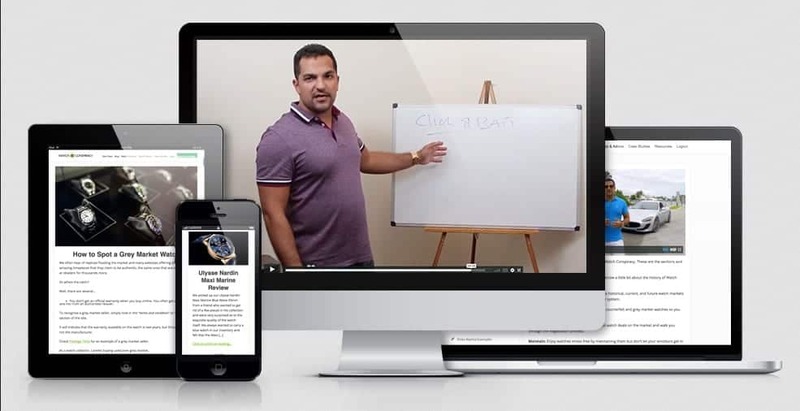 This is a training, community, and platform for serious watch traders. 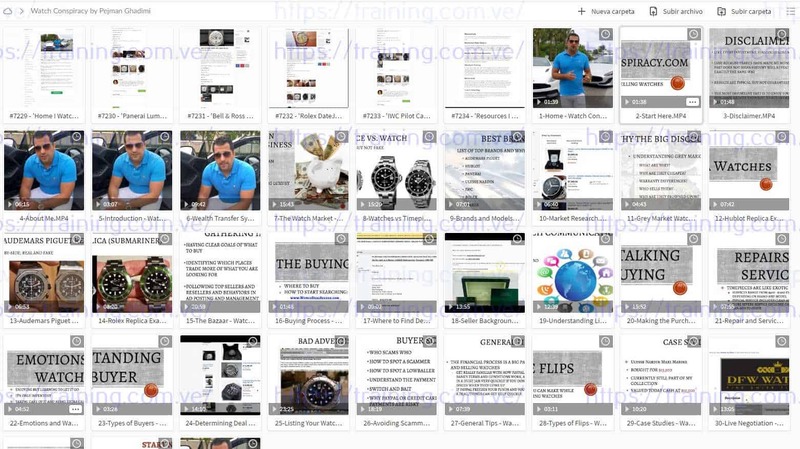 Our extensive 5 hour step-by-step training that will walk you through how to buy and sell your first luxury watch for profit. Learn about the watch industry and trends, and which brands/models to focus on. How to spot grey market and counterfeit watches from a mile away so you know exactly what you're buying. Where to find deals with live negotiation examples and knowing how much you should offer on any given watch. Learn everything you need to know about specific watch brands and models, including what's popular and how much you should pay. Exclusive reviews of watches currently in our collection including everything we hate and love about it. Our opinions on the best watches to buy at every price range from $1,500 to $25,000+. Bonus guides added regularly so you stay on top of current watch trends. Connect and network with other watch enthusiasts and traders in our private Facebook group. Ask specific questions you may have about the watch buying process from myself or other members. Get feedback and opinions on any watch you're looking at so you know if you're getting a good deal or if it's a fake. Buy, sell, and trade with other trusted members inside our private Facebook group. Our list of trusted resources for watch traders so you save money and make more money. See which watch dealers and jewelers to stay away from with our community driven blacklisted dealer list. Get additional knowledge with our optional supplementary trainings and resources. Where to go for watch service and maintenance so you don't have to pay for expensive repairs and long wait times. Get access to our library of watch flip case studies done by myself and our members. See real-world buy and sell prices so you know exactly how much to offer. Case studies of all popular brands like Rolex, Omega, Tag, Panerai, Hublot, Breitling, and much more. See the exact profits made down to the penny even if additional costs like fees or service was needed. Don't just take our word for it. Here's just a few of our students who applied our strategies and are now get paid to wear their favorite luxury watch. We literally have hundreds more. They prove that if they can do it, you can too. I'm sure you may still have questions about Watch Conspiracy. Here is a list of the most common questions we get and our response to them. If you don't see your question, please use the chat in the lower right to message us. I live in __________, does Watch Conspiracy work in my country? How much money do I need to start with? Is there an age limit to join or take advantage of these strategies? Do the strategies work on normal watches too? Are there any extra fees or hidden charges? Ready to become a watch trader? 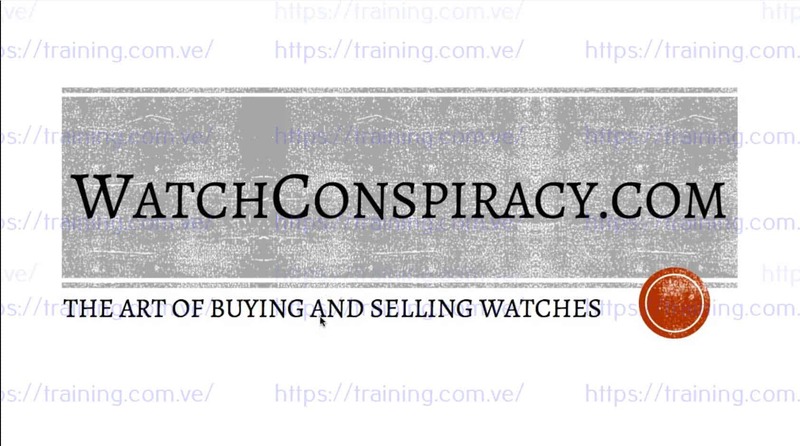 Since our launch in 2016, over 2,500 watch traders have joined Watch Conspiracy and over 250 are now making up to $15,000 trading watches. Are you next? YES! I'm ready to become a member! Your purchase is backed by a 100% action based money back guarantee within 14 days of purchase. If you have questions or concerns, please contact us at [email protected] or (800) 210-5077. Get 30% Off When You Order 3 Or More Products. The courses are up to date and will receive ALL the updates from the creators. You will not have to wait to download or limits on the speed, no need to install a special software. You only need to click on the link, and you will have access to an online folder with the content of the course. You can download the whole course as a zip file or you can choose a specific file to download.